A patriotic concert for the Northampton, Bucks County community will be celebrated Tuesday, July 3 on the grounds of St. Bede the Venerable Church, 1071 Holland Road, Holland. The concert begins at 7 p.m. 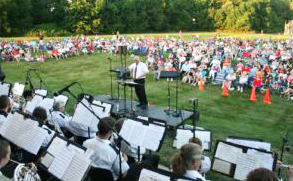 The Verdi Band of Norristown will perform patriotic favorites, a tribute to the Beach Boys and the Star Wars movies. Admission is free – bring your own chairs. Food will be available for sale. In case of rain, the concert will be held in the auditorium of Council Rock High School-South. For more information, call 215-357-5720.